Building relationships is essential for realtors. Here are some of the best real estate business card examples that look great and stand out. If you’re in the real estate business, this is a phrase you’ll hear over and over again, day in, day out. Getting sales is the key aim of any realtor, but the process doesn’t just happen overnight. It requires time to build up relationships with clients, figure out their likes and dislikes, and use that information to help make your housing selections. The process can be lengthy, but it has to start somewhere - and often, that’s with a trusty business card. Even if your business lives predominantly online, the real estate world is a face-to-face industry where you’ll have to meet clients, build up a rapport, and essentially help them make one of the biggest decisions of their lives. This means your business card isn’t just a quick and easy way to share your contact information, but it’s also a tool for helping clients remember you and to stand out amongst other realtors. Most realtors have an online presence, but the real estate industry is predominantly in-person. Source. The problem is these tiny little cards don’t really give you enough “real estate” to provide all your details and your personality. However, there are some tips and tricks you can take from other successful realtor cards to help you show off your brand and encourage clients to choose you time and time again. We’ve put together a collection of the best real estate business card examples to get those creative juices flowing. If you’re looking at the average size of a business card and thinking there’s absolutely no way you’re going to get everything on there you want, take a leaf out of Raymond Fortune’s book. His card has only the absolute vitals on, like his phone number and email address, but it also features a QR code that clients can scan to get taken to his website where he has tons more space to show off his talents and personality. If you look at a large cross-section of real estate business cards, you’ll probably notice that a lot of them are black, white, and gray in color. Not very inspiring, right? Nancy Myriad does things differently with her cards, using color and stand-out relevant illustrations to pack a punch. The colors go well together and match her branding, while the key designs indicate exactly what she’s selling with a single glance. Color is a really great way to grab the immediate attention of clients and encourage them to feel a certain way. For example, warm colors like reds and yellows stir up a “cosy” feeling, while cooler colors like blues and greens give an edgier vibe. Use the scientific color wheel to get your colors working hard for you. Sarah Marsal does things in a similar style to Nancy Myriad in that she also uses a key design as the centerpiece of her card. But, instead of bright colors, she focuses on a luxurious black and gold color palette. You can use the colors of your card to reflect your brand personality. For example, this sleek and simple design oozes charm, luxury, and high-end flourishes. Did you know that 72% of people actively judge a company based on the quality of its business cards? If you fall short, you could be losing out on clients for absolutely no reason. On top of that, 39% of consumers choose not to do business with a company that has a business card they don’t like - that’s a lot of pressure to get it right. Gone are the days when business cards were uniformly rectangular. Today, it’s possible to have your cards printed in pretty much any shape you want. In this example, Michelle Lohman really takes the real estate theme to heart and has had her cards cut into the shape of a key. It’s simple but effective. Imagine if a client is flicking through a wad of real estate business cards they’ve picked up - most of which are rectangular - and then stumbles across this one. It’s going to stand out and they’re going to remember it. 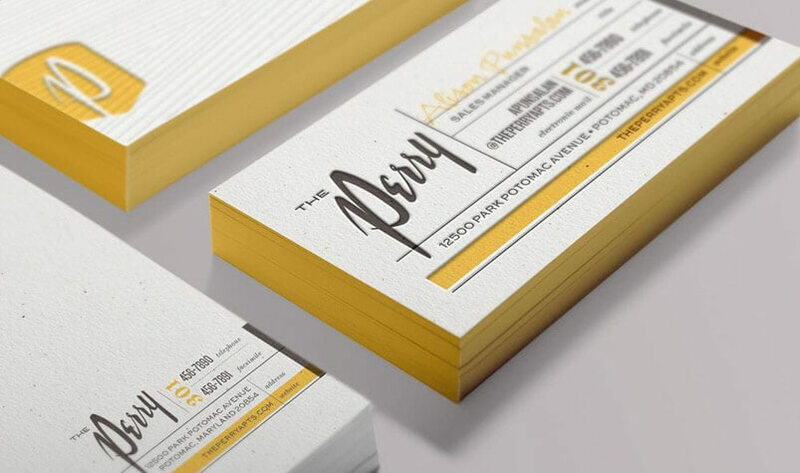 This business card for The Perry features not one, but two distinct business card design flourishes. Firstly, the strip with the website address on is embossed, giving the card a unique texture and, secondly, the edges are painted yellow to ensure the card stands out when it’s bundled together with others in a stack. Feel free to experiment with different design styles and techniques to give your card the quirky touch you want. The real estate world is a personal industry. You’re meeting and greeting clients every day, and it’s you they’re going to be building a relationship with. You can kick start the relationship off early by adding a picture of yourself to your business card. Not only will this help clients remember who you are, but it’ll also make your business seem more personable and approachable. Your not just selling houses as a realtor, you’re also selling a location - and it helps to show that you’re an expert on the specific area you specialize in. To do this, you can add a unique hint towards your area or its attractions, like Barry Eight does with this business card. His logo combines a kangaroo with the high-rises of LA to reflect the fact that he helps Australians find their perfect property in LA. The texture and feel of your card is almost as important as the information it has on it. Take this example, which is finished with a wood-style design to make it look like it’s been expertly carved. Wood itself is obviously a huge part of the housing industry, but this design also helps evoke feelings of warmth thanks to connotations of fireplaces and rustic decor. The material of your business card can really make a difference to the perception people have of your business. For example, having a card made of metal is going to give a completely different vibe and feel to a card made of fabric. Most of the business cards shown here have a simple and minimal design, but that doesn’t mean that’s what you should do. In fact, this retro-inspired card for Brixwood Properties manages to show off their personality by using vintage colors, fonts, and illustrations. Don’t feel like you have to follow the crowd and do what everyone else is doing because this won’t help you stand out. That being said, some realtors choose to go to the other end of the spectrum and keep their cards as minimal as possible. This black and gold embossed design by Jon Gilman is dominated by the logo, while the chunky thickness of the card represents quality and high-end luxury. This business card for James Anderson combines part of the retro feel of the Brixwood card and the simple luxuriousness of Jon Gilman’s design. By using just two colors on a white background, the card remains simple, easy to read, and emphasizes the luxury nature of the brand (which is also reinforced with the embossed statement “Where Luxury Lives”). We mentioned earlier that your business cards don’t have to be traditionally rectangular. In fact, this example by Keller Williams Realty shows that having rounded edges can give a fresh take to a business card. Everything else is kept simple, except the logo is embossed with shiny ink and the edges are curved to give a unique feel. The front and back of this realtor’s card is pretty simple, but turn the card on its side and you get a whole different story. From a minimal white design, the shiny gold edges give it a dash of luxury and opulence that makes it stand out in a pile of other cards and showcase the personality of the brand. Once you’ve settled on a design that reflects your business and works for you, it’s time to get your cards printed - something that can be seriously overwhelming if you’ve got lots of realtors working for you. Brandly is the easiest way to manage, order and re-order cards for realtors., You can upload individual designs and simply change out the names and vital information to ensure your business cards all have a streamlined design but still offer the personalized information of your realtors. Business cards are still a necessity for realtors. The industry is all about making connections, showcasing your expertise, and encouraging clients to go with you over another realtor, all of which can be influenced by your business card. Get it right, and your business card will easily stand out in a sea of others, bringing you more clients and building the name of your brand. Sign up to receive our newsletter to get discounts and more creative tips on designing business cards and building a brand you love.